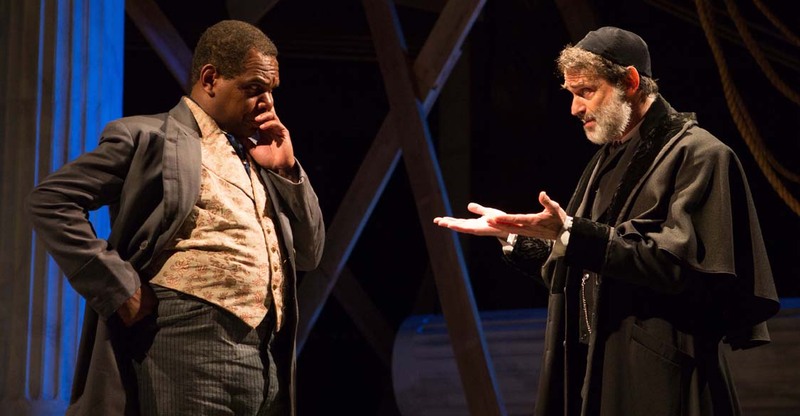 Shylock (Matthew Boston, right) works out the terms of his loan with Antoine (Craig Wallace) in Aaron Posner’s District Merchants, a variation of The Merchant of Venice. Folger Theatre, 2016. The period when Shakespeare was writing was one torn by disagreements over the proper method of observing Christianity in England. Protestantism was at war with Catholicism and the Church of England often employed coercion and even violence to enforce its hegemony. The way Shakespeare handled these divisions is the topic of this podcast episode, "There Are More Things in Heaven and Earth, Than Are Dreamt Of In Your Philosophy." Our guest is David Scott Kastan, George M. Bodman Professor of English at Yale University, who explores these questions in his book, Will To Believe: Shakespeare and Religion. David Kastan is interviewed by Neva Grant. From the Shakespeare Unlimited podcast series. © May 31, 2016. Folger Shakespeare Library. All rights reserved. This episode was produced by Richard Paul. Garland Scott is the associate producer. It was edited by Gail Kern Paster and Esther Ferington. We had help from Philip Kearney, Studio Operations Manager at the Yale University Broadcast Center, and from the News Operations Staff at NPR in Washington, DC. MICHAEL WITMORE: From the Folger Shakespeare Library this is Shakespeare Unlimited. I’m Michael Witmore, the Folger Director. So much of Shakespeare’s writing is timeless. But of course it was all written in a specific millieu; a time and place with distinct attitudes and politics. As a keen observer of his world, Shakespeare incorporated all of these surroundings into his plays. The period when Shakespeare was writing was one torn by disagreements over the proper method of observing Christianity in England. Protestantism was at war with Catholicism, and the Church of England often employed coercion and even violence to enforce its place. The way Shakespeare handled these divisions is the topic of this conversation. Our guest is David Scott Kastan, George M. Bodman Professor of English at Yale University, who explores these questions in his book, Will to Believe; Shakespeare and Religion. We call this podcast, “There Are More Things in Heaven and Earth Than Are Dreamt of in Your Philosophy”. David Kastan is interviewed by Neva Grant. GRANT: What do we know if anything about Shakespeare’s religious habits? I mean do we know, for example, that he attended church religiously? KASTAN: Religiously, that is the question. No, we don’t know very much. We know that unlike his father and unlike his daughter, he never was fined for not going to church, but that’s not necessarily evidence that he did go to church. We know he was baptized in Holy Trinity Church, and we know the date. We know a few other things about him, but we don’t actually know what he himself felt, believed, thought. But we want to. We want to desperately. GRANT: I should add that, you know, reading the book, you can really pick up on the scholar’s frustration, as so often comes up in people studying Shakespeare. It’s just there’s just so much we don’t know and this is just a classic case of that. KASTAN: Well, I think in this case we actually know a lot more than most people, non-professional Shakespeareans, realize. But we don’t know the things we really want to know. GRANT: Right, right. Well, let’s pull back a bit if we can, and talk about a few things we do know, which is just what religious life was like in England at that time. I had just heard you mention that people would be fined for not going to church, so that tells us something. KASTAN: Yes, I mean England was then—and actually today some of the same situation prevails—which is there is a state religion. I mean, this is the Church of England. But England was—though formally Protestant, it was actually a much more complicated religious environment, and there clearly were a lot of people who had been brought up in what was sometimes termed “the old faith,” the Catholic Church. And in Shakespeare’s age, you know, everyone’s parents would have been raised as Catholics. But in Shakespeare’s time suddenly there was... at different moments more contested than at others, but there was a Catholic community, and there was this official and large and sometimes splintering Protestant community. And it was hard to know what religion meant at that point. And it’s, you know, we want to think we might know where Shakespeare fit in all this, but I’m afraid we don’t. GRANT: Are there any clues to where Shakespeare fit into this based on the Bible that we think he might’ve consulted as he was writing his plays? KASTAN: Well, that’s a lovely and wonderful question. The issue is there were printed Bibles that circulated and increasingly in great numbers. The first English translation of the Bible appears published in Cologne, but it was in 1526. But it was for a variety of reasons rather ruthlessly and effectively rounded up and suppressed. But by the 1530s, from the continent an English translation of the Bible, the so-called Tyndale translation, comes into England in great numbers and is quite popular. And then there are series of English Bibles over the next 50 years or so. The major Bible of the time Shakespeare was alive in church was what was called the “Great Bible”. And the Great Bible was published in 1539 and that provided the Bible readings in church really until about 1572. And even after 1572, when the so-called Bishops’ Bible—an authorized Bible that the bishops had approved—replaced it, even then still the Psalms were read in church from that original Great Bible. So we know that the Bible Shakespeare would have heard in church as a boy would’ve been from—largely—from the Great Bible and then perhaps later the Bishops’ Bible. The most commonly read Bible was a book that was published first in English in 1560, the Geneva Bible, and that became the most popular Bible in print even to—really through—the early years of the availability of the King James Bible. And it would be wonderful if we knew that that was his Bible, but we don’t. And when you look at his own usage quoting the Bible in plays he sometimes quotes from the Great Bible, and he sometimes quotes from the Geneva Bible, and he sometimes quotes from the Bishops’ Bible. And he even sometimes quotes from the Douay-Rheims Bible, which was the sort of Catholic translation that appeared first in the New Testament in 1582 and the Old Testament in 1610. GRANT: So if I can just break in; I’m just trying to visualize this. Does he have all these Bibles on a shelf just near his writing desk and he’s just sort of reaching randomly for them, or is there some more care in the Bibles that he’s choosing at any one time to refer to and to quote from? KASTAN: I think it’s actually neither of those. I think what happens is the Bible he uses is the Bible that’s at hand. And I think he at different moments might’ve had access to different ones. I think it was more or less random. It would be lovely, for instance—he lived for a while with a Protestant Huguenot family in London, and they almost certainly had a Geneva Bible. But actually he quotes from the Geneva at times when he’s not with them. And I think the great truth is we want to make this religious scene neater than it is. A Bible was a Bible for a lot of people. And for theologians and for scholars now we make sharp distinctions between them, but I... the example I would use is Archbishop Laud in the 1630s, who in various ways has been trying to suppress the enthusiasm over the Geneva Bible. But in some of Laud’s own sermons he quotes from the Geneva Bible, even though he’s actively trying to put it, sort of, out of common use. So I think that’s true for Shakespeare too. I think wherever he happened to be there was probably easy access to a Bible. Perhaps he owned one; there is no evidence of that. But he doesn’t seem to have a consistent commitment to one translation or another. GRANT: You know I was just thinking, Shakespeare was both a literary man, of course, as well as a performer, and I’m wondering if sometimes he chose a particular phrase—regardless of what Bible it was—that he would choose one just because it so beautifully stated what he wanted to get across, that it would, not necessarily for its spiritual intent, but just because it was a beautiful piece of writing to him? KASTAN: I mean, I do think it is an interesting idea. I mean, I think he loves the language. You know, sound trumps thought often, and the beautiful delight in the way language works. You know he hears these and remembers... It’s one of the things I actually love about Shakespeare in Love, the movie, which in various ways is inaccurate. But they portray a Shakespeare who listens. And I think you’re right. I mean, I think he loves quality of words, power of images. And they’re not theologically, doctrinally consistent at all. GRANT: Can you maybe give an example? Not necessarily of beauty of language but just a play we should pay attention to, a scene or a moment we should pay attention to because of its biblical reference and what that might have meant to him? KASTAN: Well, Measure for Measure, the title’s from the Gospels. At the end of Hamlet you talk about the “special providence in the fall of a sparrow.” He comes back to those sort of big, wonderful, often metaphoric images. And there are lots of examples, and there are a series of scholars who carefully traced every Biblical allusion in the plays—and there are hundreds—to decide which ones matter and how they matter. GRANT: Well, just to switch gears a little: Something I found so fascinating in the book is the descriptions of what early modern Christians believed and how that can be reflected in their responses to certain aspects of Shakespeare plays. For example, what was their attitude toward ghosts? KASTAN: Ghosts is the wonderful question. Ghosts were a sort of flashpoint, I would say, for early modern Christians, whether Catholic or Protestant, because the reality or the non-reality of ghosts is the place where the two theological distinctions become visible. What’s at stake in that is somehow, what do you have to do to be saved? So you see a ghost in Hamlet who claims to be essentially a purgatorial ghost. Well, a Catholic believes that there could be ghosts, there are purgatorial ghosts, spirits of the dead who have not yet been sent either to heaven or hell, but Protestants don’t. I always have this fantasy of—Hamlet in the play goes to University at Wittenberg, which was Martin Luther’s university, I think the one thing that people might’ve known about Wittenberg. So I have this fantasy of Hamlet attending Luther’s lectures and not paying complete attention as princes are wont to do. But when people write about ghosts, what they tend to say is, “Most likely, what you’ve seen isn’t a ghost; it’s a hallucination, it’s too much beer, it’s too much sausage.” The second possibility would be, it could be a sort of angelic visitor, a minister from heaven. A third possibility would be that it’s demonic. And then only Catholics believe a fourth possibility, which is it could be a purgatorial ghost. The ghost presents himself as a purgatorial ghost. So it’s a Catholic ghost presenting himself to his Protestant-educated son. KASTAN: Which is really fascinating to think how much Shakes—there’s an interesting example in which Shakespeare has taken a contemporary theological controversy and turned it into the stuff of drama. And what the Prince Hamlet does when he sees the ghost, he responds like a perfectly, well-trained, Wittenberg, Lutheran student. He says, you know, “Be thou a spirit of health or goblin damned?” You know, are you an angel or are you a devil? “Bring with thee intents from heaven or blasts from hell”? And then he does this incredible thing. He says, “Thou com’st in such a questionable shape that I’ll call thee ‘Hamlet,’ ‘King,’ ‘Father,’ ‘Royal Dane.’” You know, somehow, “I know what I was taught, but here’s this thing that doesn’t make any sense, but, boy, it looks like Daddy, and this is really unnerving.” You know, and then he can say to Horatio, “There are more things in heaven and earth than are dreamt of in your philosophy.” I mean theology class doesn’t quite work for this thing. GRANT: But as you also point out, and I found this so fascinating—as he and Horatio kind of puzzle over this ghost they use “he” and “it.” Sometimes they talk about it as “he” and sometimes they refer to it as more of a kind of a specter, as kind of something that’s really ephemeral. KASTAN: And you know, you realize Hamlet… Part of what this story is is not so much theological but psychological in Hamlet’s yearning for his dead father that, you know, he never really got to say goodbye too. GRANT: Yeah, I want to talk about how some other religions are portrayed in Shakespeare’s plays. For example, the portrayal of Shylock in The Merchant of Venice. What would Shakespeare’s audience at that time have known about Jews? KASTAN: Not very much, at least in terms of any direct experience of Jews. They’d been formally banished from England in 1290, and weren’t legally allowed to return really until the middle of the 1650s. On the other hand, Judaism was a visible part of theological vocabularies. Christianity is what theologians call a supersessional religion. It supersedes something that it imagines as prior to it but sort of part of its history. And it has an odd sort of double logic: Jews are somehow embryonic Christians or stubborn Christians, refusing Christianity. And I think it’s part of the discourse of the sixteenth century. So Jews were alive in the imagination. They’re present in some of the drama of Shakespeare’s predecessors; most obviously Marlowe’s Jew of Malta, a kind of Machiavellian Jew who enjoys certain of his double dealings. But these were stereotypes of Jews that were available. GRANT: I was just going to say, I mean, that’s a stereotypical portrayal, as was, as many scholars have written; the portrayal of Shylock in The Merchant of Venice. GRANT: And yet at the end, we learn that Shylock is going to have to convert to Christianity. So there’s a parting message. KASTAN: And it’s... but it’s not exactly clear what that message is. I mean there’s a... Luther actually talks about... Hamlet’s teacher. Luther at one point has this idea of what gets translated as a kind of charitable hatred, that it seems awful to force somebody to convert, but if the price is your soul that you could save that would be a good thing. But how do you force a conversion? What can it mean? You can perform an act of Christian practice, but if you don’t believe it, it obviously can’t do any good. And so it’s a very strange moment and more interesting... I mean, I think that is an interesting one of the punishments. The interesting theme is sort of structural. Act Five, Shylock... there’s no place for him in Belmont. And then there’s the way in which that world of Belmont turns again back to collapse that sense of difference. Lorenzo has that vision of this beautiful night with the stars glittering in the sky, and he looks up and he just sees them as you know “patens of bright gold.” The sense that somehow everything in this world gets reduced to commerce. That’s the term of value, and the Christians somehow think they’re better than this Jewish world. And then the complication is how much they are alike, and Shylock is given a kind of interiority that the normal Jewish stereotype doesn’t have. But there’s still the way in which the similarity is on the basis of kind of some of their least attractive qualities. So it’s a very complicated play. It plays with the stereotype, but sort of uses the stereotype to kind of undo a certain kind of self-regard in this particular Christian community. In a sort of fantasy of a, you know, inclusive cosmopolitanism, that it turns out is, at some deep level, a lie. GRANT: I want to talk now about a character who converts to Christianity before the play even begins, and that is Othello, who of course we assume was a Muslim before he converted. And, but, more presently is a Moor, and that’s really how he’s identified, that’s how his otherness is expressed. KASTAN: And then as soon as the Turkish threat disappears Othello is instantly replaced. They... when they need him they treat him well, and when they don’t it turns into “Guess Who’s Coming for Dinner?” There’s this odd way as you know, “We will respect you, we will honor you. You can come eat at my home, but don’t marry my daughter.” And Shakespeare seems so interested in what this cosmopolitan fantasy allows you to imagine but can’t quite do. GRANT: You point out in the book that there are people who for centuries have called the love of Shakespeare a secular religion. And you have this really interesting take on that because you say, by using that phrase, “Shakespeare, a secular religion”, we might neglect the actual religious language and concerns that actually animate some of his plays. KASTAN: Right, I think that’s, for me, terribly important. I think one of the things that happened when they... you know a sort of set of Enlightenment values had become normative in certain intellectual communities. And, you know, every community somehow in the West has somehow claimed Shakespeare for its own intellectual projects, and they of course claimed him too. And there’s a review in the Edinburgh Review in the nineteenth century and someone said, “Well, while the rest of Europe was lurching between Rome and Geneva”—between Catholicism and Protestantism—“Shakespeare set out for the oceans of humanity." And the idea was that religious thought was narrow and that what was great about Shakespeare was this larger inclusive imagination. And then something interesting happened both in the theater and in the academy—and I think for general readers—is in various ways it started to become implausible that Shakespeare could escape this intense religious universe, you know, saturated by religion in almost every possible way. And the one thing I’m sure of about Shakespeare—there’s much I’m not sure of—is he lived intensely and attentively in his world, and he missed none of this. Religion is inescapable. What one of my favorite quotations in the book was—I was just reading through some Commons records, House of Commons records, for some other project—and the Speaker of the House in England in 1601 says, “You ask me what the most important thing in the world is, and I will say religion. And if you ask me what the second most important thing is the world is, I’ll say religion. And the third most important thing, I’ll say religion.” Shakespeare knew that. And the idea to turn him into a secular Enlightenment writer gets it wrong. But then we went the other way and the goal became, “Well, let’s find out what Shakespeare’s religion was.” Because that’s the need we feel, that’s the lack, that’s the hole that we want to fill. And so people claimed him in various ways for you know, somehow their own religion. There’s a certain kind of interest in claiming him as a fellow traveler. But he... religion mattered to him desperately. What his religion was seems to me unavailable. GRANT: So we all, as you just said, we all want Shakespeare to sort of be our fellow traveler. He is a reflection of us; we want to see ourselves in him. Do you think that explains the revival of interest in Shakespeare’s religion by scholars generally? KASTAN: You know, I think they’re down to about a million. It’s an astonishing thing. But the whole rest of the world has seemed to embrace this, and Shakespeare becomes an extraordinary way of recognizing its centrality, you know, in our culture and indeed in every culture. GRANT: What a fascinating conversation. Thank you so much. WITMORE: David Scott Kastan is the George M. Bodman Professor of English at Yale University. His book Will to Believe: Shakespeare and Religion was published by Oxford University Press in 2014 as part of their Oxford-Wells Shakespeare Lectures Series. David was interviewed by Neva Grant. This podcast, “There Are More Things in Heaven and Earth Than are Dreamt Of In Your Philosophy”, was produced by Richard Paul. Garland Scott is the associate producer. It was edited by Gail Kern Paster and Esther Ferington. We had help from Phillip Kearny, Studio Operations Manager at the Yale University Broadcast Center, and from the News Operation Staff at NPR in Washington, DC.